For a long time, those responsible at REINER had thought about whether the mobile marking products were better placed in office supplies as electrical stamps, or whether marking with mobile inkjet printers did fit the packaging industry, too. The decision to exhibit was the right one: At least two colleagues were on site in Düsseldorf on all seven trade-fair days. As they hoped, there was plenty for them to do. At stand 61 in hall 15, REINER from Furtwangen presented its goods at a community stand together with a long-term customer: Firma Röltgen from Solingen. The REINER handheld jetStamp products or the mobile inkjet printer REINER 940 are no novelties in the mobile marking product range, but they were a matching novelty for the packaging trade fair in this form, with these uses and with their diverse offer of inks. The handheld inkjet printer jetStamp graphic 970 and mobile marking device REINER 940 play their strengths particularly in the area of mobile marking of documents, packagings or products. With the specially developed "PCset graphic" software, consecutive numbering, date, time, text or a consecutively numbering barcode can be generated easily on the computer and placed in the desired location of the print by clicking with the mouse. Among others, the data can then be transferred to the mobile Inkjet printers using Bluetooth. The marking units are also increasingly used in small food producers with a use-by date. The quick-drying ink designated P1-MP4-BK, in connection with the REINER handheld jetStamp 790 MP / 791 MP / 792 MP, offers a perfect basis even at a smaller investment budget. Smooth surfaces, such as glass, can be printed on with an even more colour-intensive and wipe-proof print. Be they farmers, coffee roasters, beekeepers or brewers – small producers always look for good solutions for simplified use-by marking. REINER is also best prepared in terms of integration of the mobile marking units into existing IT structures with industry and medium-sized businesses. The number of requests for marking of products, transport containers or in connection with outer packaging is "apparently" a relevant subject in SMEs. REINER therefore has had a standard printer driver for Windows (GDI) programmed for its products as well. The handheld inkjet printer jetStamp graphic 970 and the mobile marking device REINER 940 are delivered with a Windows printer driver, which makes it possible to transfer database texts from Word and Excel. This permits printing mobile data from Word and Excel. Thus, e.g. address data for a form letter can be transferred to the devices mobile by Bluetooth, and then printed onto the envelopes. The printer driver can be downloaded for free from www.reiner.de under the respective product. Creating and printing special 2D barcodes requires special software. REINER cooperates with NiceLabel, the leading software manufacturer in the area of barcode and RFID label solutions, in order to meet these requirements. Labels generated in the NiceLabel software can be transferred to the REINER units and then printed. In case of special software wishes, NiceLabel has an international dealer network and offers user support for its customers in many countries. The days at interpack2017 in Düsseldorf have paid off. 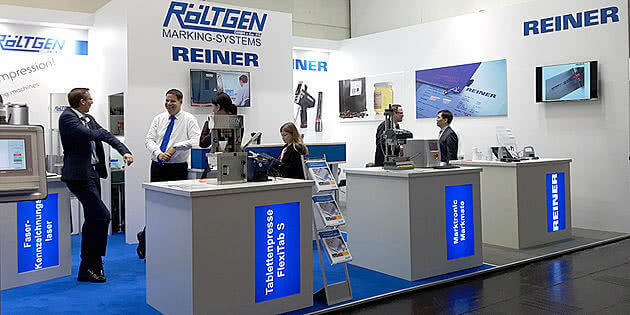 The mobile REINER marking units match the leading trade fair as exhibits very well. They fit their special niche perfectly. Marking – simply, quickly, mobile!